- Publisher Sharpen the biblical knowledge of young churchgoers and watch them have fun at the same time! Features 20 bible games that are guaranteed to please and to teach in an exciting way. Includes: Zonk; Dinosaur Daze; Sky War; Good Guys and Bad Guys, and more. Patterns, instructions and hints included for each game. 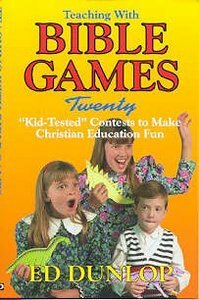 About "Teaching With Bible Games"
Sharpen the biblical knowledge of young churchgoers and watch them have fun at the same time! Features 20 bible games that are guaranteed to please and to teach in an exciting way. Includes: Zonk; Dinosaur Daze; Sky War; Good Guys and Bad Guys, and more. Patterns, instructions and hints included for each game. Statistics In Management; Data -- Types, Sources And Methods Of Collection; Using Excel For Statistical Analysis; Summarising Data Pivot Tables And Graphs; Descriptive Statistics -- Location Measures; Descriptive Statistics -- Dispersion And Skewness Measures; Basic Probability Concepts; Probability Distributions; Sampling And Sampling Distributions; Confidence Interval Estimation; Hypotheses Tests Single Population (means And Proportions); Hypotheses Tests -- Comparison Between Two Populations (means And Proportions); Chi-squared Hypotheses Tests; Analysis Of Variance: Comparing Multiple Population Means; Linear Regression And Correlation Analysis; Index Numbers: Measuring Business Activity; Time Series Analysis: A Forecasting Tool; Financial Calculations: Interest, Annuities And Npv.